Whilst they do offer instruments suitable for many uses, Orion are probably best know for producing good quality, great value for money telescopes and binoculars for astronomy. Indeed they have a very comprehensive range of astro binoculars within their stable, but of all of them, the Orion Giant View 25x100 binocular is their biggest and most powerful. We'll start with the most obvious feature: The 100mm lenses places these firmly within the category of giant binoculars. If you think of them like a windows, where bigger ones let in more light, then it is easy to imagine how these super large lenses are able to capture more light. Which at night (when used for astronomy) is understandably important. Considering the very powerful 25x magnification, being able to still have a more than acceptable 4mm exit pupil is great. 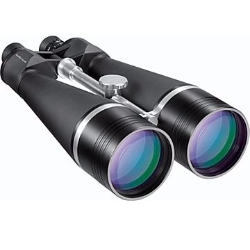 It is far better than 20x70 and 25x70 binoculars and matches that of the popular 20x80 configuration, yet you get the an added 5x power to get you even more detailed views. large lenses and all the light gathering potential in the world is no good if that light does not make it through the optical pathway and onto your eyes. So it is great to see that Orion optics have added multi-layer coatings of an anti-reflection material to every lens surface throughout the 25x100 Giant View . This will certainly add to image brightness and deliver an obvious improvement when compared to lesser quality instruments that are often only single layer coated or fully coated - but only on the external lens surfaces. Whilst I know almost every binocular in this class will have exactly the same, I just wish they would use twist-up eye-cups and not the simple rubber folding type. Whilst it is good that they have one, 1 year is a little mean. Most brands offer 5 to 10 years these days, with many offering lifetime guarantees. Taking all into account this and their main specs (see below) the Orion Giant View 25x100 Binoculars look to be an ideal choice for those after a good value, mid to high level High Powered, Long Distance Viewing binocular, for both stargazing and terrestrial use. Please Note: I have not yet fully tested or reviewed these Orion GiantView 25x100 Binoculars and so I cannot comment on the build quality or that of the view that you get whilst looking through this instrument. What I am able to do is to form some basic and logical opinions based on the stated specifications, features and my experience. We can then compare these with the many others that I have used and reviewed here on BBR. The reasons for me providing this basic listing is for information purposes as these stats and features make it easy for them to be compared against all the other binoculars that I have fully tested and reviewed.